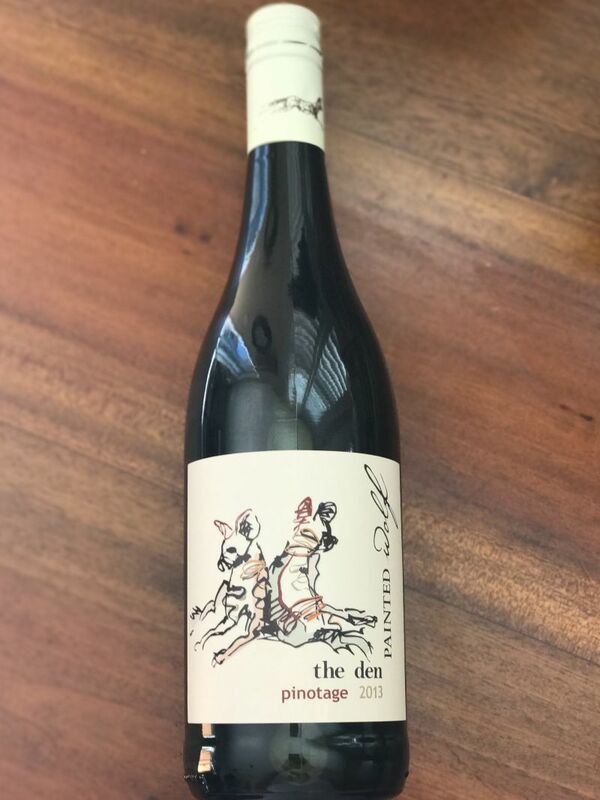 This week’s bargain wine is Painted Wolf Pinotage. 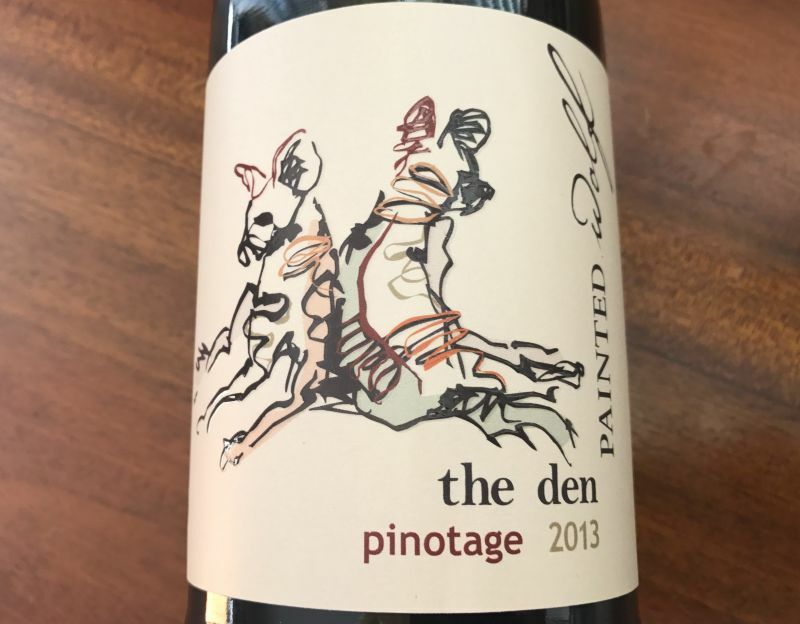 American readers may not be familiar with the Pinotage grape, as it is a South African variety and hard to find in the US. Pinotage was bred in 1925 in South Africa as a cross between Pinot Noir and Cinsault; two classic French grapes. At the time, the latter of these varieties was known as Hermitage, so the name is a combination of PINOT Noir and HermitAGE. Despite the subtle wines associated with its parents, Pinotage tends to produce big, assertive wines. The company at which I work has an after hours wine club. As strange it as may sound, I am involved in the club. I was not the founder, but seem to have become the organizer. We limit each session to twelve attendees; sometimes we get fewer people. We aim to bring one bottle for each four attendees and take it in turns to provide the wine. Each meeting is focused on a particular type of wine; our first session had us drinking Carneros Pinot Noir. The wine selected is based on the results of a poll among members of the club. Our most recent meeting, as you may have guessed from the first paragraph, required the contributors to bring South African Pinotage wines. I had added this option as a wild card, not expecting its selection. Curiosity from unfamiliar members made it a clear winner. However, it turned out to be a hard wine to find in California. Only two members located a bottle, but fortunately, we had a lower than usual turnout. The two wines were strikingly different. The first provided by a colleague was the 2015 Spier Signature Pinotage. The nose gave a strong first impression of plummy fruitiness backed by odours of wood. The taste was rich, heavily tannic, with a finish that softened to reveal notes of raspberry. In that mid-palate, I found black tea. One of my co-workers said she tasted burnt toast. This was a complex wine; hard to pin down. The second was the only Pinotage that I could find in our home town. It was a 2013 The Den, from Painted Wolf. The nose was less appealing than the first wine, my notes say: “funky”. A subsequent inhalation gave me an aroma that reminded me of Indian curry. The colleague who found burnt toast in the previous wine said she detected cedar wood. The immediate impression when I took a sip of the wine was of a notably higher acidity. The tannins, on the other hand, were far less prominent. The flavour was of plum and wood, which were merely the most striking parts of a complex wine. I was in a minority, but this wine was the group’s favourite. I agree that was the easier wine to drink now, but the Spier wine would benefit from age and pairing with rich food. In summary, both wines were interesting. They offered excellent complexity for the price and demonstrate that Pinotage is a variety for which the search will be rewarded. I purchased the Painted Wolf Pinotage at Bevmo for $13.99 (Reduced from $16.49). I would have been happy with the wine at full price and it is a definite bargain at the lower price.